Melchor Pérez de Holguín, El Juicio Final (Detail). Photo: Daniel Giannoni. 04 / 2019: Photographic expedition to Spain and Portugal returns with more than 500 photographs of Colonial Art. 04 / 2019: PESSCA research presented at the IV Simposio Internmacional Investigadores Jóvenes del Barroco Iberoamericano in Extremadiura, Spain. 03 / 2019: Novedades de PESSCA 63 is published. 03 / 2019: Correspondence 4600 is reached. 02 / 2019: PESSCA to participate in an exhibit at the ICPNA to launch the Museo del Grabado. 02 / 2019: PESSCA to support the formation of a Museo del Grabado at the Instituto Cultural Peruano Norteamericano (ICPNA) in Lima, Perú. 02 / 2019: Novedades de PESSCA 62 is issued. 02 / 2019: PESSCA research presented at the course Historia y Arte Peruano: Rumbo al Bicentenario, organized by the Biblioteca Nacional del Perú. 01 / 2019: Novedades de PESSCA 61 is out. 12 / 2018: Amigos de PESSCA now number 200. 12 / 2018: Correspondence 4500 is up. 12 / 2018: Over the last month, 1500 individuals visited the PESSCA website. Together they conducted 2100 visits, viewed 11,000 pages, and clocked about 123 hours. Visits came from the United States (19%), Peru (11%), Spain (8%), Mexico (8%), the United Kingdom (6%), Colombia (5%), and 76 other countries. 12 / 2018: Novedades de PESSCA 60 is posted. 12 / 2018: A course based on PESSCA research to be given at the Conjunto Monumental San Francisco (Lima) in the second semester of 2019. 12 / 2018: PESSCA research to be presented at a conference at the Conjunto Monumental San Francisco (Lima) on April 22-27, 2019. 12 / 2018: Visit to the Priet-Gaudibert Collection of Spanish Colonial Art in Versailles, France. 11 / 2018: PESSCA research presented at l'École des hautes études en sciences sociales (EHESS) in Paris, France. 11 / 2018: Print research launched at the Biblioteca Nacional del Perú and other national heritage libraries of the country. 11 / 2018: Photographic expedition to Mexico City concludes with more than 1900 photographs of Novohispanic Art. 10 / 2018: Talk delivered at the Museo Nacional de San Carlos (Mexico CIty) on the use of prints in Novohispanic Art. 10 / 2018: PESSCA research featured in a Kuba Szutkowski video introducing an installation by Sol Calero at the Museum Boijmans Van Beuningen. 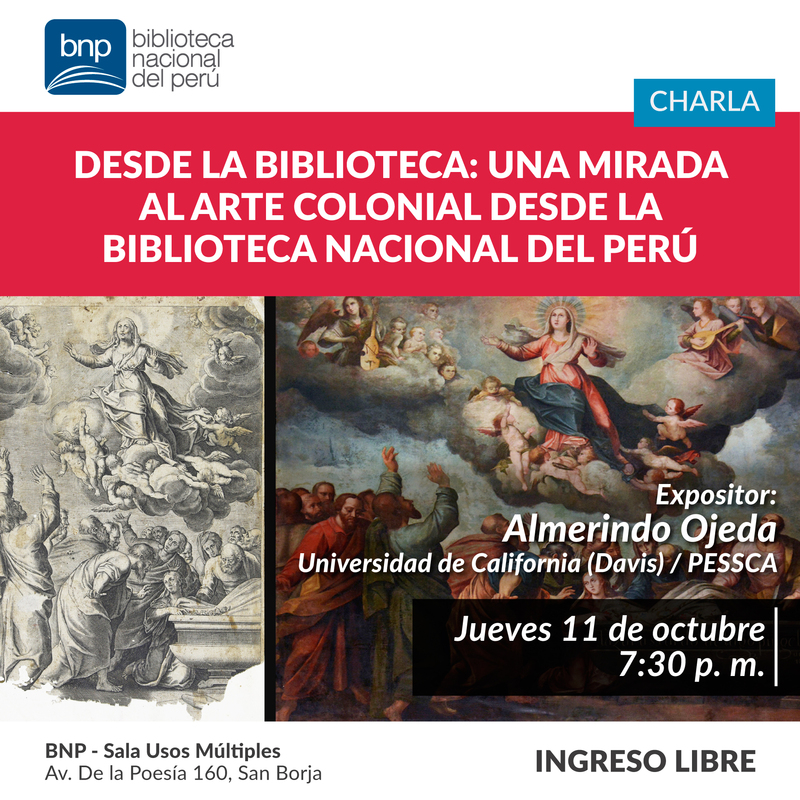 10 / 2018: Lecture on PESSCA research delivered at the Biblioteca Nacional del Perú. 09 / 2018: Specialist workshop on print identification and description delivered at the Biblioteca Nacional del Perú. 09 / 2018: Novedades de PESSCA 59 is out. 09 / 2018: Correspondence 4400 is up. 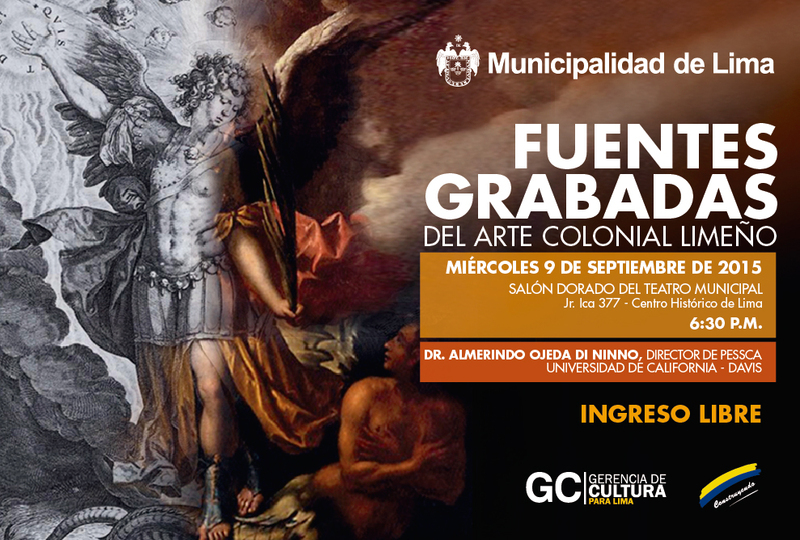 09 / 2018: PESSCA research to be presented in October in a lecture delivered at the Museo Nacional de San Carlos, Ciudad de México. 09 / 2018: True bidirectional mirroring is established between the original PESSCA website and the replica hosted by the Pontificia Universidad Católica del Perú at artecolonial.pucp.edu.pe. Now, any change to one of these sites is, ipso facto, a change to the other. 09 / 2018: Peruvian online journal La Mula publishes interview on PESSCA. 08 / 2018: Seminar on PESSCA research to be presented in November at l'École des hautes études en sciences sociales (EHESS) in Paris, France. 08 / 2018: General talk on PESSCA research at the Biblioteca Nacional del Perú to be presented in October. 08 / 2018: PESSCA to lead specialist workshop in September on print identification at the Biblioteca Nacional del Perú. 08 / 2018: Survey of 16th, 17th, and 18th century print albums carried out at the Biblioteca Nacional del Perú. 08 / 2018: Survey of colonial works held at the Instituto Riva Agüero (Lima, Perú). 07 / 2018: Novedades de PESSCA 58 is posted. 07 / 2018: Short photographic expedition on the Camino de Santiago (Navarra, La Rioja, Burgos, León, and Galicia). 07 / 2018: PESSCA research presented at the 56th International Congress of Americanists in Salamanca, Spain. 06 / 2018: PESSCA research to be presented at the Segundo Congreso Internacional de Arte Peruano (Universidad Nacional Mayor de San Marcos, Lima, Perú). 06 / 2018: Novedades de PESSCA 57 is out. 06 / 2018: Correspondence 4300 is up. 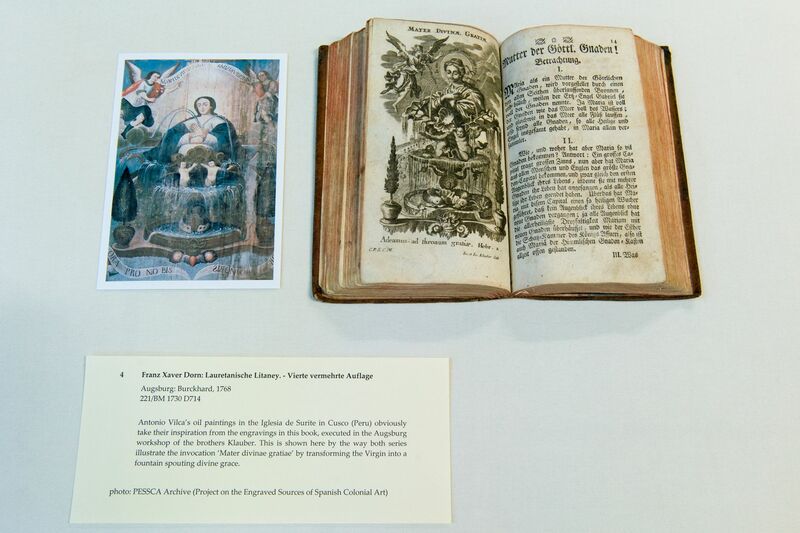 05 / 2018: Field trip through the State of Mexico returns with 15 books and 700 images of Spanish Colonial Art. 04 / 2018: PESSCA interview in puntoedu, the weekly magazine of the Pontificia Universidad Católica del Perú. 04 / 2018: Novedades de PESSCA 56 is posted. 04 / 2018: PESSCA to research the colonial collections of the Instituto Riva Agüero, Lima, Perú. 04 / 2018: PESSCA Director named Honorary Member of the Instituto Riva Agüero, Lima, Perú. 03 / 2018: Presentation of PESSCA research at the Universidad Católica del Perú. 02 / 2018: Novedades de PESSCA 55 is out. 02 / 2018: Correspondence 4200 is reached. 01 / 2018: Over the last month, 1425 indiviuduals visited the PESSCA website. Together they conducted 2051 visits, viewed 13903 pages, and clocked about 185 hours. Visits came from the United States (22%), Peru (14%), the United Kingdom (9%), Spain (8%), Mexico (6%), and 68 other countries. 01 / 2018: PESSCA to look into image recognition software as a research tool. 01 / 2018: Novedades de PESSCA 54 is issued. 01 / 2018: Expedited review of new correspondences is restored. 12 / 2017: PESSCA research to be featured at an art show to open in October 2018 at the Museo Nacional de San Carlos, in Mexico City. 12 / 2017: Novedades de PESSCA 53 is issued. 12 / 2017: Correspondence 4100 is posted. 11 / 2017: Photographic expedition to Buenos Aires, Salta, Jujuy, and Córdoba returns with more than 1200 photographs of Spanish Colonial art. 11 / 2017: PESSCA research presented at the IX Encuentro Internacional sobre Barroco (Buenos Aires). 11 / 2017: Novedades de PESSCA 52 is mailed out. 11 / 2017: Amigos the PESSCA now number 175. 11 / 2017: PESSCA research to be presented at the 56° Congreso Internacional de Americanistas (Salamanca 2018). 10 / 2017: Lightning photographic expedition to Lima returns with hundreds of photographs. 10 / 2017: PESSCA Research presented at the I Congreso Internacional de Arte Peruano (Universidad Nacional Mayor de San Marcos). 10 / 2017: Novedades de PESSCA 51 is out. 9 / 2017: Photographic expedition returns from Lima with more than 17000 photographs of Spanish Colonial Art. 9 / 2017: Photographic expedition returns from Cusco with more than 1400 photographs of Spanish Colonial Art. 9 / 2017: Work of PESSCA presented at the IV Festival del Barroco Latinoamericano (Cusco, Peru). 9 / 2017: PESSCA plays a role in the recovery of a second stolen masterpiece of Spanish Colonial Art. 9 / 2017: Correspondence 4000 is posted. 9 / 2017: PESSCA research to be presented at the I Congreso Internacional de Arte Peruano (Universidad Nacional Mayor de San Marcos, October 2017). 9 / 2017: The work of PESSCA is featured at the Permanent Seminar on the Digital Humanities founded at the Pontificia Universidad Católica del Perú. 9 / 2017: The Pontificia Universidad Católica del Perú offers an extracurricular seminar based on PESSCA research. 8 / 2017: PESSCA deepens its collaboration with the Museo Pedro de Osma in Lima, Peru. 7 / 2017: The Proyecto de Estudios Indianos opens a research line on Historia del Arte Virreinal Americano based on the work of PESSCA. 7 / 2017: Photographic expedition to Quito returns with more than 4500 photographs of Spanish Colonial art. 6 / 2017: PESSCA plays a role in the recovery of a stolen masterpiece of Spanish Colonial Art. 6 / 2017: Novedades de PESSCA 49 is issued. 6 / 2017: Correspondence 3900 is reached. 5 / 2017: PESSCA research to be presented at the IX Encuentro Barroco (Buenos Aires, November 2017). 5 / 2017: Novedades de PESSCA 48 is posted. 4 / 2017: PESSCA invited to present at the IV Festival del Barroco Latinoamericano (Cusco, September 2017). 4 / 2017: PESSCA to acquire the state-of-the-art Hollstein catalog of the graphic works after Jan van der Straet. 4 / 2017: Novedades de PESSCA 47 is out. 4 / 2017: Correspondence 3800 is posted. 3 / 2017: Novedades de PESSCA 46 is posted. 3 / 2017: Correspondence 3700 is reached. 3 / 2017: Seminar based on PESSCA research to be offered at the Pontificia Universidad Católica del Perú in August 2017. 3 / 2017: PESSCA to acquire a complete set of photographs of the large collection of thesis sheets of the Staats- und Stadtbibliothek Augsburg. 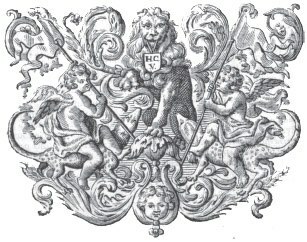 3 / 2017: PESSCA to acquire the state-of-the-art Hollstein catalog of the graphic works after Maarten de Vos. 2 / 2017: Novedades de PESSCA 45 is out. 1 / 2017: Major exhibit based on the work of PESSCA opens in Cusco. 1 / 2017: Photographic exhibit to Cusco returns with more than 2300 photographs. 12 / 2016: Novedades de PESSCA 44 is posted. 12 / 2016: Correspondence 3600 is reached. 11 / 2016: Novedades de PESSCA 43 is out. 10 / 2016: Novedades de PESSCA 42 is issued. 10 / 2016: Correspondence 3500 is posted. 09 / 2016: Novedades de PESSCA 41 is released. 09 / 2016: PESSCA research is featured at a major exhibit on Cuzco School Painting at the Museo de Arte de Lima (MALI). 09 / 2016: Presentation of PESSCA research at the Pontificia Universidad Católica del Perú, Lima. 09 / 2016: Presentation of PESSCA research at the Seminario de Santo Toribio, Lima, Perú. 09 / 2016: Major photographic expedition to the City of Cusco and its environs returns with thousands of photographs. 08 / 2016: Exhibition based on PESSCA research to be inaugurated at Casa Garcilaso (Cusco) in January 2017. 08 / 2016: Course on Spanish Colonial Art based on PESSCA research is delivered in Cusco. 08 / 2016: PESSCA research to be featured at an exhibit in Mexico City in 2018. 08 / 2016: Photographic Expedition to Arequipa returns with hundreds of photographs of Spanish Colonial Art. 08 / 2016: Presentation of PESSCA research at the Siglo de Oro Conference in Arequipa. 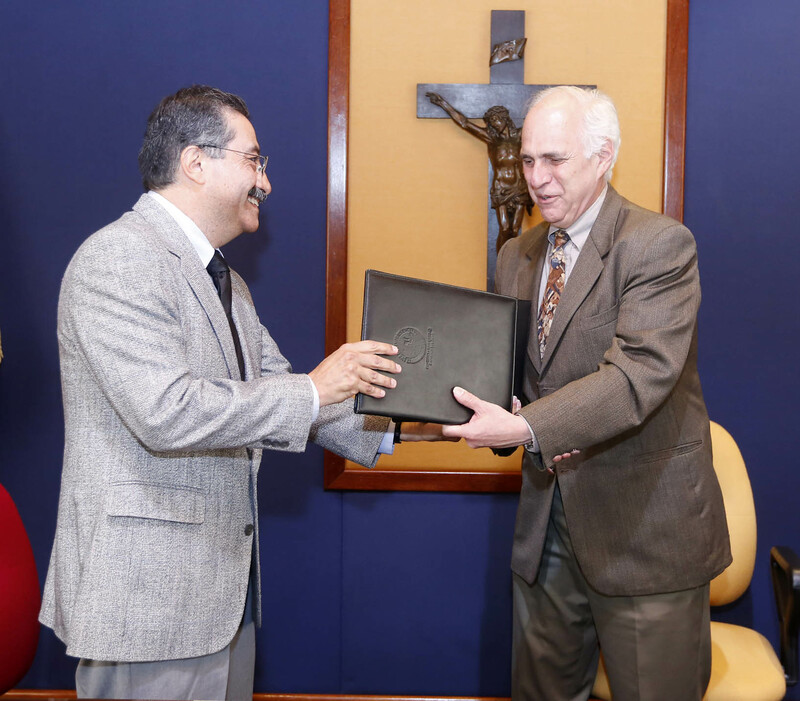 08 / 2016: Research collaboration launched with the rare book library at the Convento de la Recoleta, Arequipa. 08 / 2016: Major exhibit in Arequipa features PESSCA research. 07 / 2016: Novedades de PESSCA 40 is out. 07 / 2016: Correspondence 3400 is posted. 07 / 2016: PESSCA invited to present materials at an upcoming exhibition of Colonial Art at the Museo de Arte de Lima (MALI). 07 / 2016: Collaborative project is launched regarding a set of gilded copperplates at the Osma Museum in Lima, Perú. 07 / 2016: Lightning photographic expedition in Arequipa is launched. 07 / 2016: Lightning photographic expedition in Lima is launched. 07 / 2016: PESSCA Gallery 14 (Epigraphy of the Prophets of Congonhas) opens. 06 / 2016: The PESSCA website received more than 20,000 visits in the last month. 05 / 2016: Novedades de PESSCA 39 is issued. 04 / 2016: Correspondence 3300 is reached. 04 / 2016: Novedades de PESSCA 38 is posted. 04 / 2016: Collaboration with PESSCA highlighted in the Museo de Osma facebook. 03 / 2016: Novedades de PESSCA 37 is issued. 03 / 2016: Lightning photographic expedition to Quito returns with hundreds of photographed pieces. 03 / 2016: De Augsburgo a Quito catalog launched in Quito at the Iglesia de la Compañía de Jesús. 12 / 2015: A new exhibition based on PESSCA research is set for Summer 2016 at the Convento de Santa Catalina, Arequipa, Peru. 12 / 2015: Novedades de PESSCA 36 is out. 12 / 2015: Correspondence 3200 is posted. 12 / 2015: The catalog for the De Augsburgo a Quito show is published. 11 / 2015: The UC Davis Journal of the Institute for Social Studies reviews PESSCA. 11 / 2015: Novedades de PESSCA 35 is released. 10 / 2015: Novedades de PESSCA 34 is issued. 10 / 2015: Correspondence 3100 is reached. 10 / 2015: In the last month, 1876 individuals made 2548 visits to the PESSCA website, collectively viewing 17532 pages. 09 / 2015: Photographic expedition to Cuzco returns with more than 1000 photographs. 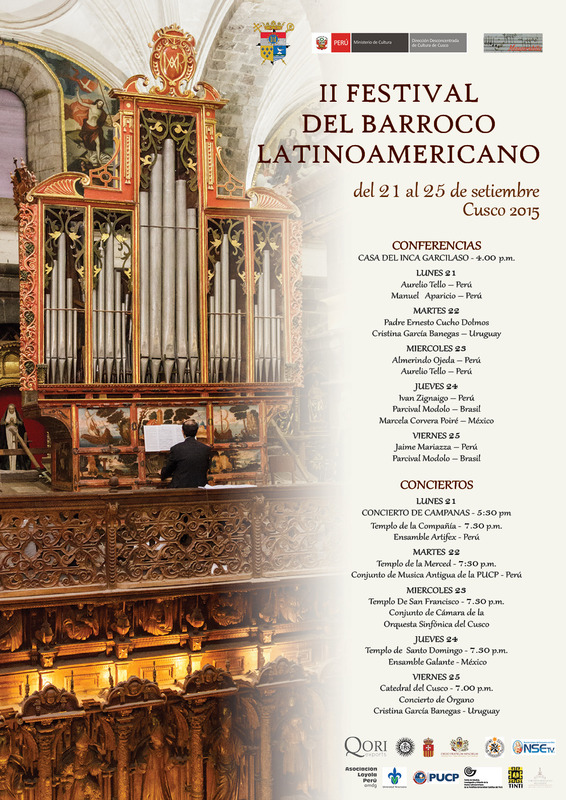 09 / 2015: Presentations of PESSCA research at the II Festival Internacional del Barroco Latinoamericano and at the Escuela de Bellas Artes (Cuzco, Peru). 09 / 2015: Photographic expedition to Lima returns with more than 150 photographs. 09 / 2015: Presentation of PESSCA research at the Miércoles Patrimoniales series of the Muncipalidad de Lima. 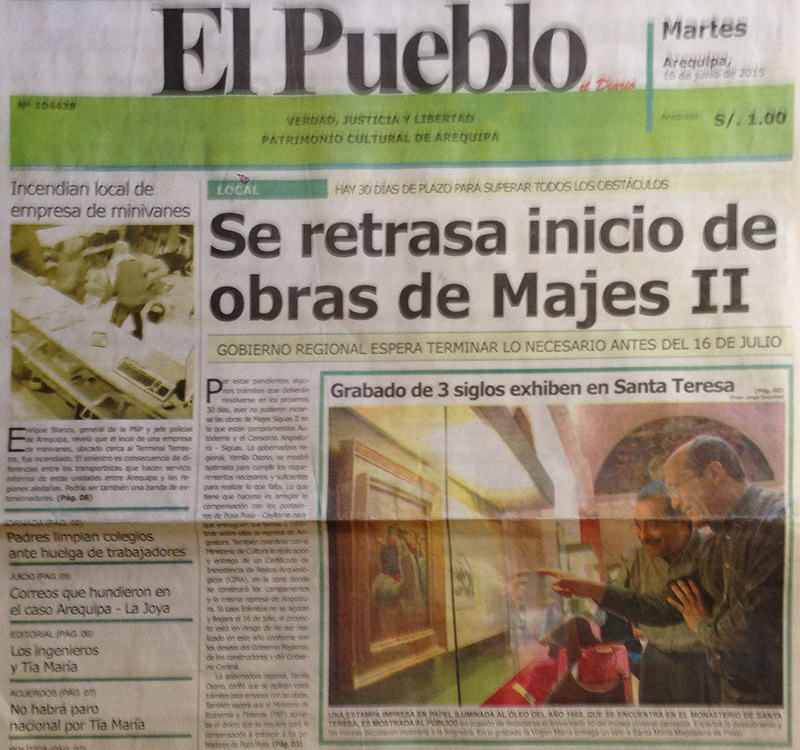 08 / 2015: New gallery opens in PESSCA site (Gallery 13: The Elogia Mariana of the Great Cathedral of Cuzco). 08 / 2015: Novedades de PESSCA 33 is released. 08 / 2015: PESSCA acquires photographs of more than two hundred Klauber engravings from the Biblioteca Nacional de Portugal. 07 / 2015: PESSCA research featured at Para Vos Nací, art exhibit organized by the Municipalidad de Lima. 07 / 2015: Correspondence 3000 is posted. 06 / 2015: PESSCA Findings reported by news organizations in Arequipa. 06 / 2015: Photographic Expedition to Arequipa and Valle del Colca returns with hundreds of photographs. 06 / 2015: Presentation of PESSCA results at the VIII Encuentro Internacional sobre Barroco (Arequipa, Perú). 06 / 2015: PESSCA is ten years old. 05 / 2015: Novedades de PESSCA 32 is out. 05 / 2015: Correspondence 2900 is reached. 04 / 2015: PESSCA joins international effort led by the Archbishopric of Cuzco to find, catalog, research and publicize colonial artworks of the city. 04 / 2015: PESSCA Archive acquires photographs of more than a hundred 18th century engravings produced in Augsburg at the Klauber Workshop. 03 / 2015: Novedades de PESSCA 31 is published. 02 / 2015: In the last month, 1485 individuals made 1932 visits to the PESSCA website, collectively viewing 14996 pages (Source: Google Analytics). 02 / 2015: Novedades de PESSCA 30 is issued. 02 / 2015: Correspondence 2800 is posted. 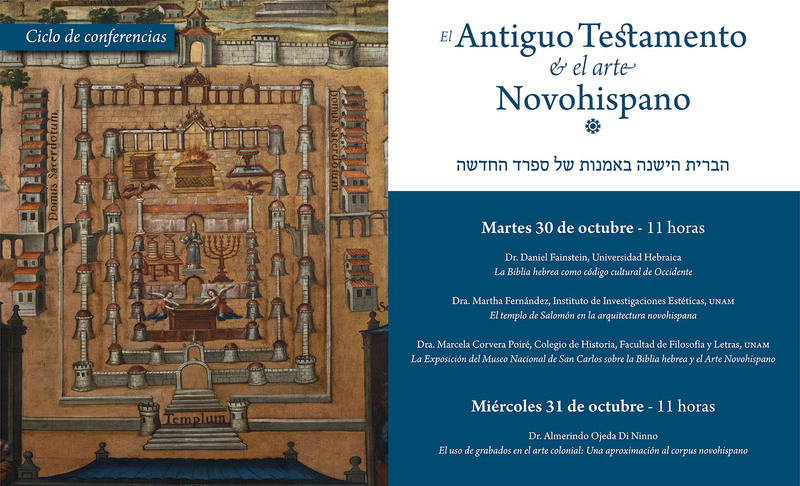 01 / 2015: Collaboration with the Museum of the Convento de Santa Catalina, Arequipa, Perú. 10 / 2014: Novedades de PESSCA 28 is issued. 10 / 2014: Correspondence 2600 is posted. 09 / 2014: Research visit to the Museo de América (Madrid) is completed. 09 / 2014: Results of PESSCA research are presented at the VIII Congress of the Seciedad de Estudios Históricos de Navarra (Museo de Navarra, Pamplona). 09 / 2014: Novedades de PESSCA 27 is released. 08 / 2014: Photographic expedition to Lima returns with hundreds of photographs. 07 / 2014: Major exibit opens in Quito based on PESSCA research. 07 / 2014: Novedades de PESSCA 26 is issued. 07 / 2014: Correspondence 2500 is reached. 07 / 2014: PESSCA Workshop at the Universidad Católica organizes the entire set of PESSCA correspondences by artwork location (click here). 07 / 2014: Lightning photographic expedition to Ayacucho returns with 1GB of photographs. 06 / 2014: Lightning photographic expedition to Cuzco returns with 2GB of photographs. 05 / 2014: The Pontificia Universidad Católica del Perú installs a mirror of the PESSCA site in its institutional repository (click here). 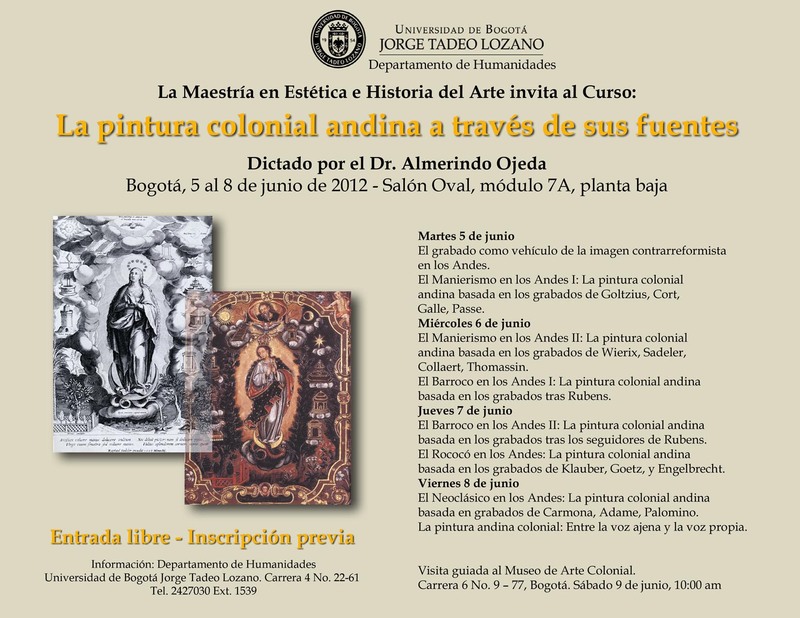 05 / 2014: Lightning photographic expedition to Quito returns with 600 photographs of colonial artworks. 04 / 2014: PESSCA lectures and workshops are begun at the Pontificia Universidad Católica del Perú. 03 / 2014: Novedades de PESSCA 24 is issued. 03 / 2014: Correspondence 2400 is posted. 02 / 2014: Gallery 12: The Celestial Dome of El Sagrario de Quito opens. 02 / 2014: Filipa Medeiros contributes photographs of the illustrations to the Missale Romanum of Lisbon, 1784. 01 / 2014: Novedades de PESSCA 23 is released. 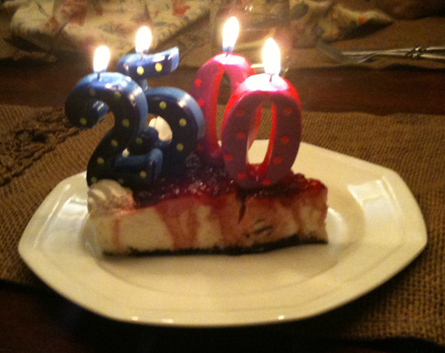 12 / 2013: The Friends of PESSCA list registers its 100th member. 12 / 2013: Visitors to the PESSCA website collectively view more than 40,000 pages of the site in the last month. 12 / 2013: Correspondence 2300 is reached. 12 / 2013: PESSCA is mentioned in Desde la Sala, órgano informativo de la Sala Antioquia, Biblioteca Pública Piloto, Medellín, Colombia. 11 / 2013: Novedades de PESSCA 22 is issued. 11 / 2013: The Pontificia Universidad Católica del Perú will host a mirror of the PESSCA site. 10 / 2013: Visitors to the PESSCA website collectively view more than 30,000 pages of the site in the last month. 09 / 2013: Novedades de PESSCA 21 is out. 09 / 2013: PESSCA featured at the 28th Congress of the International Bibliophile Association (Augsburg University Library Session). 09 / 2013: Expedition to Germany returns with photographs of more than 1700 engravings produced in 18th century Augsburg. 09 / 2013: Correspondence 2200 is posted. 08 / 2013: Gallery: 11 The Remarkable Apostles of Göz - Klauber - Rodríguez opens. 08 / 2013: Rubem Amaral Jr. donates to PESSCA a valuable collection of photographs of Brazilian Colonial art. 08 / 2013: Correspondence 2100 is reached. 07 / 2013: Novedades de PESSCA 20 is posted. 07 / 2013: Photographic expedition to Quito returns with close to 3000 photographs of Colonial Art. 07 / 2013: Presentation of PESSCA research at the Centro Cultural Metropolitano, Quito, Ecuador. 07 / 2013: Review of PESSCA in the Society for Emblem Studies Newsletter, Volume 53. 07 / 2013: Presentation of PESSCA research at the Universidad Andina Simón Bolívar, Quito, Ecudaor. 06 / 2013: Presentation of the PESSCA project at the Universidad Católica del Perú. 05 / 2013: PESSCA joins the team producing The Art of Painting in Colonial Bolivia (forthcoming from Saint Joseph's University Press). 05 / 2013: Novedades de PESSCA 19 is out. 05 / 2013: Correspondence 2000 is posted. 05 / 2013: PESSCA receives a grant from the University of California Humanities Network (University of California Humanities Research Institute); it is then supplemented by the UC Davis Humanities Institute and the UC Davis College of Letters and Science. 05 / 2013: Lightning visit to the Spanish Colonial holdings in the Brooklyn Museum, Saint Joseph's University, and the Huber Collection. 04 / 2013: Novedades de PESSCA 18 is released. 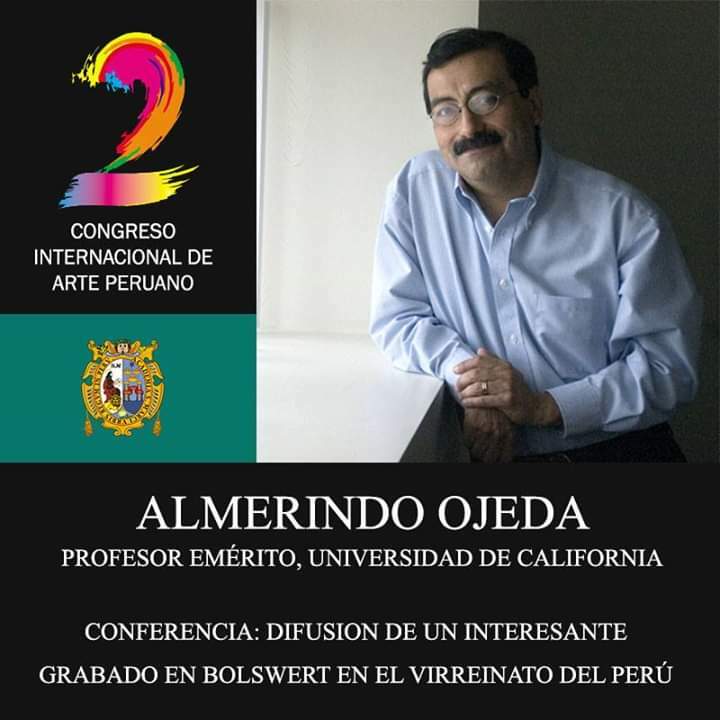 04 / 2013: PESSCA invited to present at the Universidad Andina in Quito, Ecuador. 03 / 2013: Google Analytics records more than 2000 visits to the PESSCA website in one month. In them, 1415 people viewed 20422 pages. 02 / 2013: Novedades de PESSCA 17 is issued. 02 / 2013: Correspondence 1900 is reached. 01 / 2013: Google Analytics records more than 1500 visits to the PESSCA website in one month. 01 / 2013: Novedades de PESSCA 16 is released. 01 / 2013: PESSCA invited to present the results of its research at The Fourteenth Colony: California Indians, Missions, Presidios, and Colonists in the Hispanic Frontier, 1769-1848, a workshop organized by the Institute of Archaeology of the California State University at Monterey Bay with support from The National Endowment for the Humanities. Asilomar, California, July 13-19, 2013). 12 / 2012: Research at the Reserves, Cabinet des Estampes, Bibliothèque Nationale de France, in Paris. 12 / 2012: Correspondence 1800 is posted. 11 / 2012: Novedades de PESSCA 15 is issued. 09 / 2012: Novedades de PESSCA 14 is released. 09 / 2012: Correspondence 1700 is reached. 09 / 2012: A collaboration is launched with the Museo de Arte de Lima (MALI). 08 / 2012: PESSCA examines the latest additions to the Colonial collection of the Museo de Arte de Lima (MALI). 07 / 2012: Photographic expedition to the Monasterio de Santa Teresa de Ayacucho is undertaken. 07 / 2012: The Pontificia Universidad Católica del Perú funds a photographic expedition to Ayacucho. 07 / 2012: Seventy five scholars, collectors, curators, conservators, marchands, photographers, and art enthusiasts are now Friends of PESSCA. 07 / 2012: Novedades de PESSCA 13 is issued. 07 / 2012: Comprehensive photographic capture of the paintings of the Iglesia de Jesús, María, y José in Lima. 06 / 2012: PESSCA reaches correspondence 1600. 06 / 2012: Friends of PESSCA meet in Lima to discuss future enhancements to the project. 06 / 2012: PESSCA is granted access to the Jaime Borja Archive of images of Neogranadine Art. 06 / 2012: Photographic expedition to Colombia (Bogotá, Boyacá, and Popayán). 06 / 2012: A series of lectures based on PESSCA research is delivered at the Jorge Tadeo Lozano University in Bogotá, Colombia. 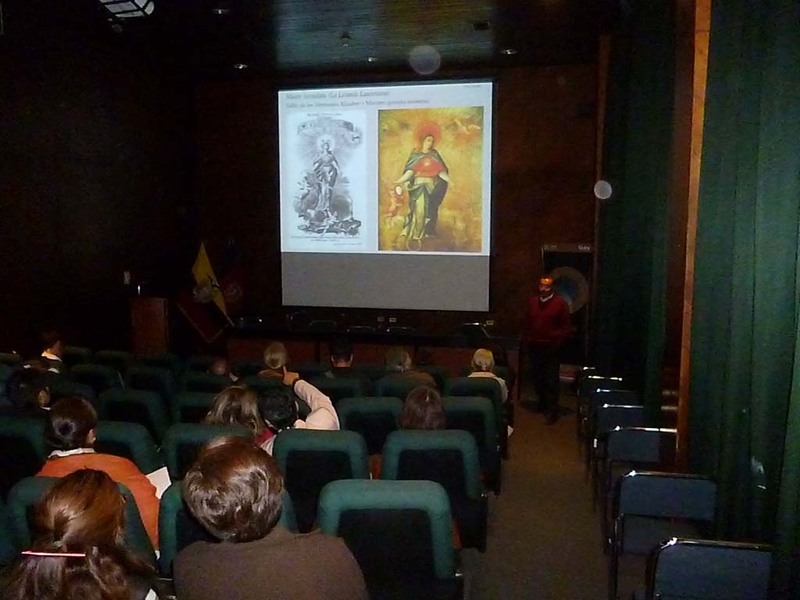 05 / 2012: A lecture based on PESSCA research is delivered at the Catholic University in Lima, Peru. 05 / 2012: A series of master classes based on PESSCA research is delivered at the Catholic University in Lima, Peru. 03 / 2012: Novedades de PESSCA 11 is issued. 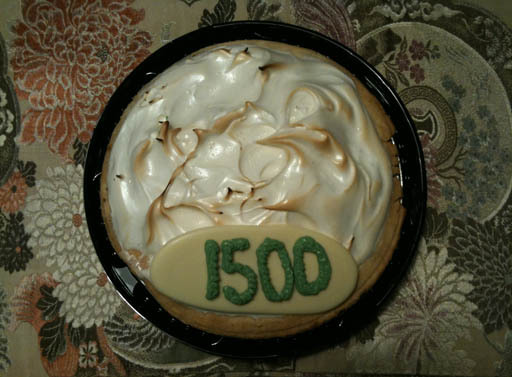 02 / 2012: PESSCA reaches correspondence 1500. 02 / 2012: The Inter-American Institute for Advanced Study in Cultural History opens to us its collection of images of Colonial Latin American art. 01 / 2012: Novedades de PESSCA 10 is issued. 01 / 2012: PESSCA to participate in the scholarly exchange program between the UCD-HIA and the PUCP. 01 / 2012: Photographic expedition to Goa (India) returns with more than 700 images. 11 / 2011: Novedades de PESSCA 9 is issued. 11 / 2011: Correspondence 1400 is reached. 08 / 2011: More than fifty scholars, collectors, curators, conservators, marchands, photographers, and art enthusiasts are now Friends of PESSCA. 08 / 2011: Correspondence 1300 is posted. 08 / 2011: Gallery 10: Las Sibilas del Palacio de Minería is installed. 07 / 2011: Collaboration with the Peruvian National Library begins. 06 / 2011: Novedades de PESSCA 7 is issued. 06 / 2011: PESSCA is mentioned in scholarly publication from Medellín, Colombia (Historelo 3(5)). 06 / 2011: The correspondences of the PESSCA Archive are now organized by subject. 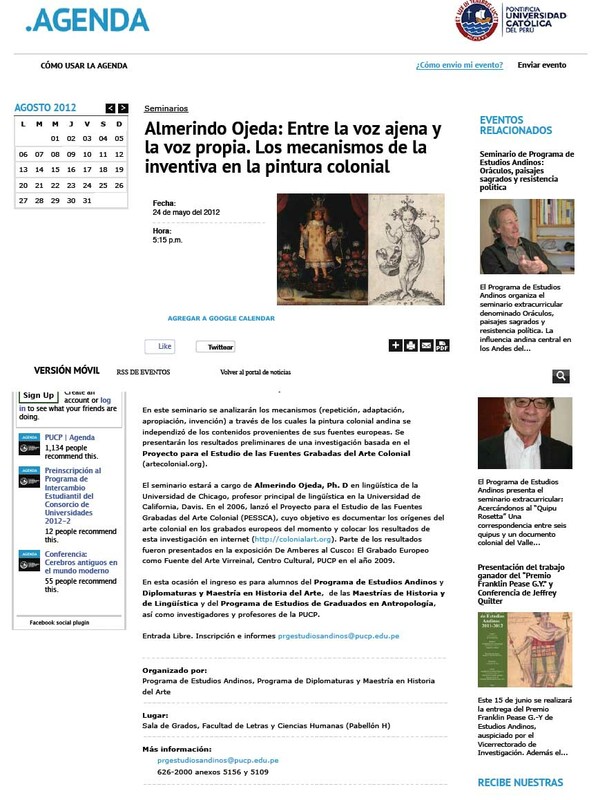 06 / 2011: Travel to Mexico City to acquire colonial art publications. 06 / 2011: Second photographic expedition to the California mission of San Juan Bautista. 05 / 2011: PESSCA posts its 1200th correspondence. 04 / 2011: Photographic Expedition to the California missions of San Juan Bautista and Nuestra Señora de la Soledad. 03 / 2011: Novedades de PESSCA 6 is issued. 02 / 2011: Novedades de PESSCA 5 is issued. 02 / 2011: PESSCA hits its 1100th correspondence. 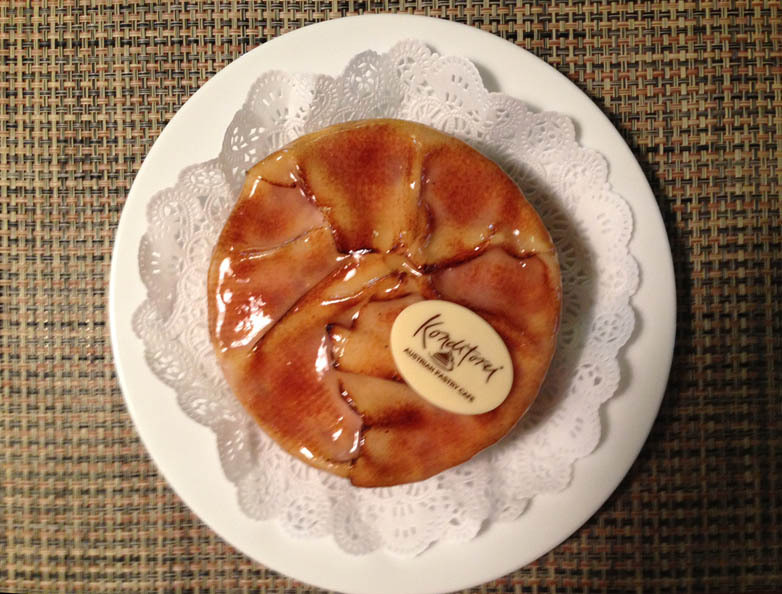 02 / 2011: The Espínola Collection (Valencia, Spain) shares with PESSCA digital images of its important print holdings. 01 / 2011: Novedades de PESSCA 4 is issued. 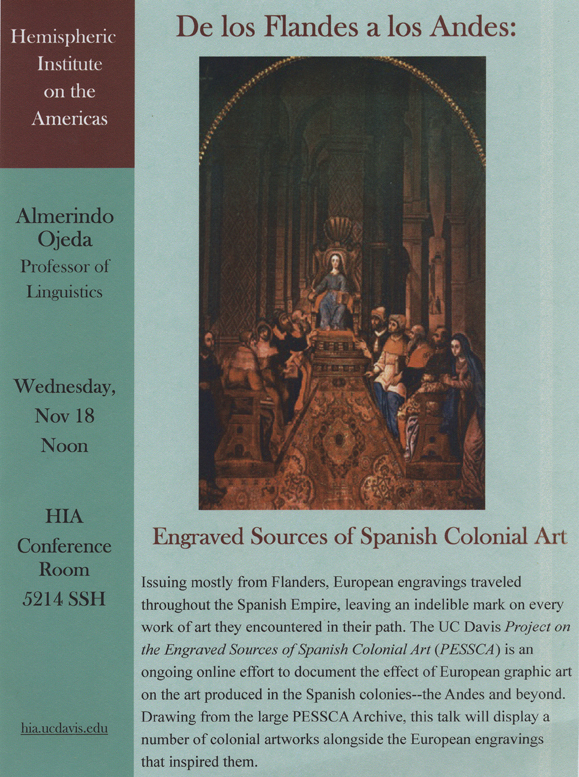 12 / 2010: The UC Davis Hemispheric Institute on the Americas supports with a grant the hosting of the PESSCA website. 11 / 2010: Novedades de PESSCA 2/3 are issued. 11 / 2010: Collaborative efforts initiated in Spain. 11 / 2010: Lightning photographic expedition led in Mexico City, Tepotzotlán, Puebla, and Cholula. 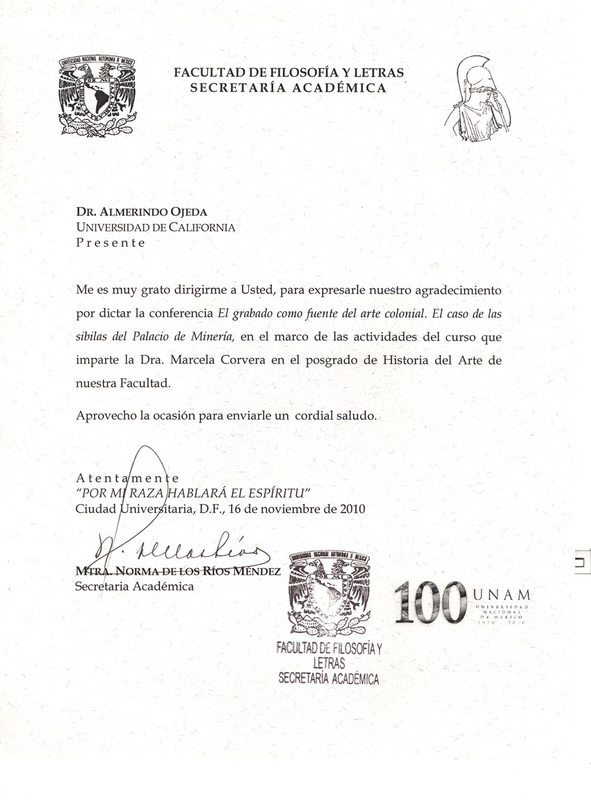 11 / 2010: PESSCA is presented at the Universidad Nacional Autónoma de México (UNAM). 11 / 2010: PESSCA REACHES CORRESPONDENCE NUMBER 1000. 09 / 2010: PESSCA correspondences in permanent display at the Pedro de Osma Museum in Lima, Peru. 09 / 2010: PESSCA is mentioned in Desde la Sala, órgano informativo de la Sala Antioquia, Biblioteca Pública Piloto, Medellín, Colombia. 08 / 2010: PESSCA reaches its 900th correspondence. 08 / 2010: The Friends of PESSCA mailing list is formed. 08 / 2010: PESSCA website adds a Recent Changes page and offers RSS feeds. 07 / 2010: Translation of the site reaches its final stretch: translating the artwork entries. 06 / 2010: Presentation of PESSCA at the Pontificia Universidad Católica del Perú. 06 / 2010: PESSCA site garners 4th place in Google searches with key words colonial art. 06 / 2010: The Pontificia Universidad Católica del Perú sponsors PESSCA's photographic expedition to Lima. 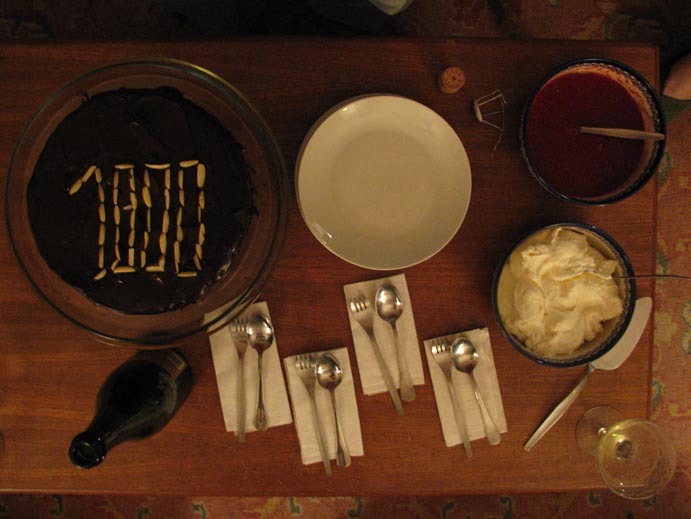 05 / 2010: PESSCA celebrates its fifth anniversary. 05 / 2010: PESSCA hits its 800th correspondence, gathering in one year as many correspondences as it gathered in the previous four. 03 / 2010: Translation of the PESSCA website into Spanish begins. 02 / 2010: The UC Davis Hemispheric Institute on the Americas supports with a grant the hosting of the PESSCA website. 02 / 2010: PESSCA reaches its 700th correspondence. 02 / 2010: PESSCA receives a grant from Catholic University in Lima, Peru, to translate the PESSCA site into Spanish. 12 / 2009: Users may enlarge archival images by clicking on them. 12 / 2009: PESSCA site garners 5th place in Google searches with key words colonial art. 11 / 2009: PESSCA hits its 600th correspondence. 10 / 2009: PESSCA posts its 500th correspondence. 10 / 2009: Collaborative efforts initiated in Colombia. 09 / 2009: Collaborative efforts developed in Argentina. 09 / 2009: PESSCA site ranks 7th in Google searches with keywords colonial art. 08 / 2009: Collaborative efforts established in Mexico. 08 / 2009: PESSCA posts its 400th correspondence. 06 / 2009: The Pontificia Universidad Católica del Perú sponsors PESSCA's photographic expedition to Cuzco. 06 / 2009: PESSCA reaches its 300th correspondence. 05 / 2009: PESSCA goes public and launches an open website.